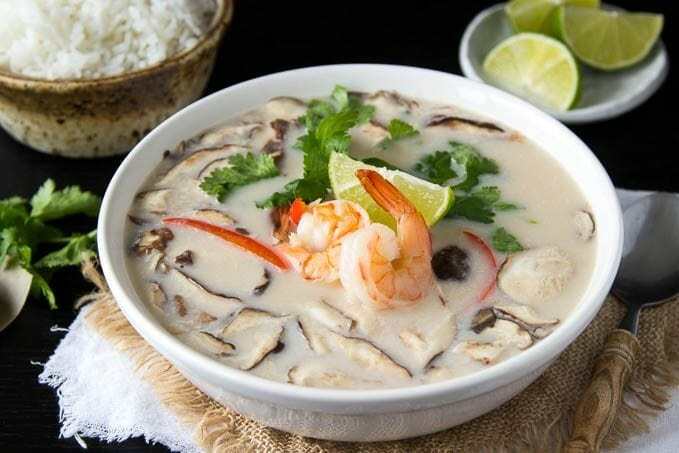 Thai Coconut Soup with Shrimp ( Tom Kha Soup) -Making Thai soup at home is actually really easy! All the classic flavors that make Thai soup so delicious like coconut milk, lemongrass and ginger in an easy to make (and quick) recipe. You should be able to find all the ingredients at your local grocery store. Perfect for cold winter nights. It’s that time of year, so much to do! Holiday parties, shopping, travel, not to mention all the normal things you do in a day. Here’s a quick recipe to get dinner (or lunch) on the table in about 30 min. I LOVE Thai food! and especially Thai soup! and up until a few months ago there was a really good Thai restaurant in my neighborhood. I say up until a few months ago because the building that housed the restaurant was torn down (and the restaurant moved across town) to build a new multi -level residential/commercial building . Boo hoo! It was a sad day for me…they just might have known me by name at the restaurant and what I liked to order . Spicy coconut soup aka Tom Kah soup was one items I frequently ordered. 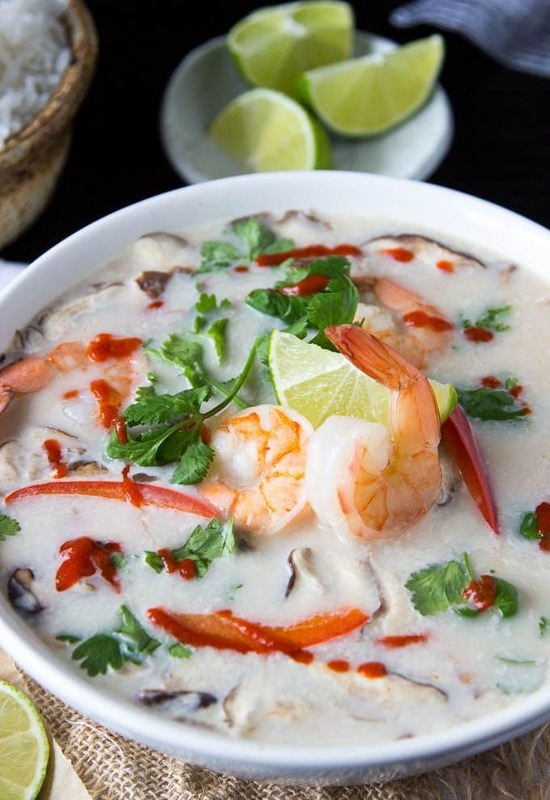 If you haven’t had Tom Kah soup before…it’s a very warming, aromatic soup that includes coconut milk, lemongrass, ginger, red curry paste and lime, It can be made vegetarian or with chicken (Tom Kah Gai) or Shrimp (Tom Kah Goong). I’ve been playing around with this recipe to try to replicate the Tom Kah Soup I used to get at the restaurant and I think I finally NAILED IT!! Is it wrong that I’ve been slurping this soup and simultaneously muttering ….ummm! ummm! ummm!? Nah, it’s just that good! And bonus…it can be made easily in one pot in about 30 mins. I’m bringing back “One Pot Wednesday’s”. I started earlier this year bringing you recipes on Wednesdays that can be prepared in one pot/pan etc. Making mid-week meals super simple. Somehow I got away from them, but I’m bringing them back (starting today) so look for new one pot ideas every Wednesday. 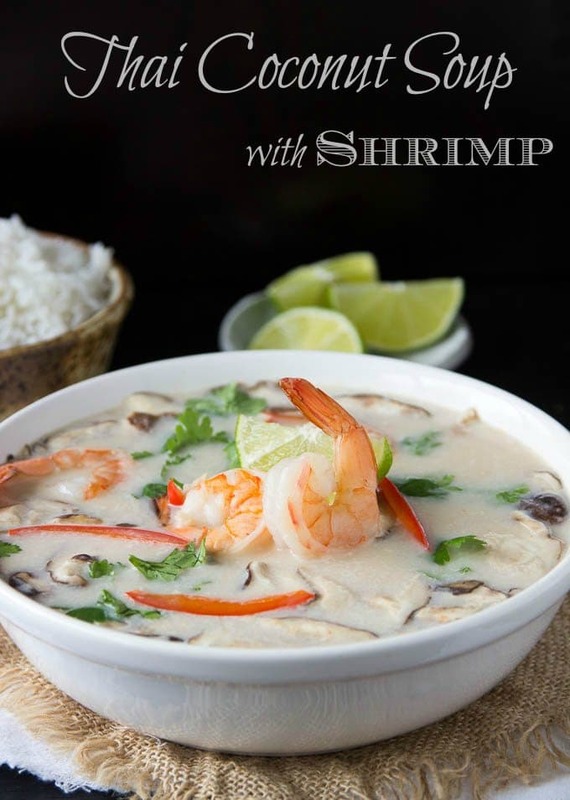 Thai Coconut Soup with Shrimp ( Tom Kha Soup) -Making Thai soup at home is actually really easy! 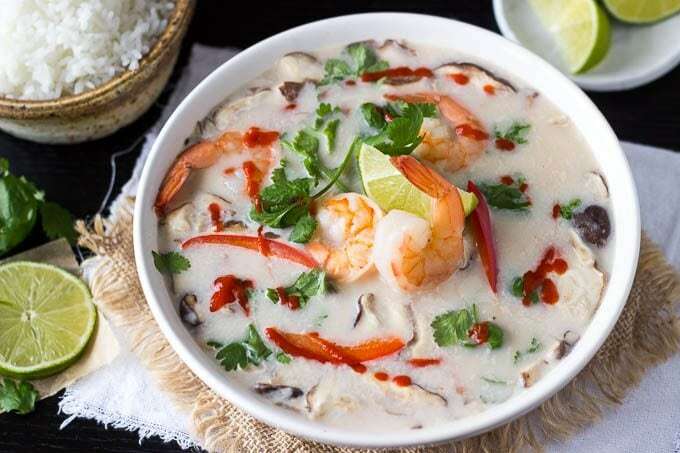 All the classic flavors that make Thai soup so delicious like coconut milk, lemongrass and ginger in an easy to make (and quick) recipe. You should be able to find all the ingredients at your local grocery store. In a large pot or Dutch oven add broth, ginger, lemongrass, curry paste and fish sauce and simmer for about 10 mins. Add coconut milk, mushrooms and red bell peppers. Continue to cook stirring occasionally, until mushrooms are soft (about 5 min.). Add shrimp, continue to cook until shrimp are fully cooked (about 5 min.). Remove from heat, remove lemongrass stalks and stir in lime juice. Stir in cilantro, reserving a small amount for garnish. Can be served as a soup or over jasmine rice for a heartier meal option. * you should be able to find fish sauce at well stocked grocery stores (in the Asian section). If it's not available you can sub 1 Tbsp worcestershire sauce + 1 Tbsp low sodium soy sauce. Oh my gosh…..YUM! 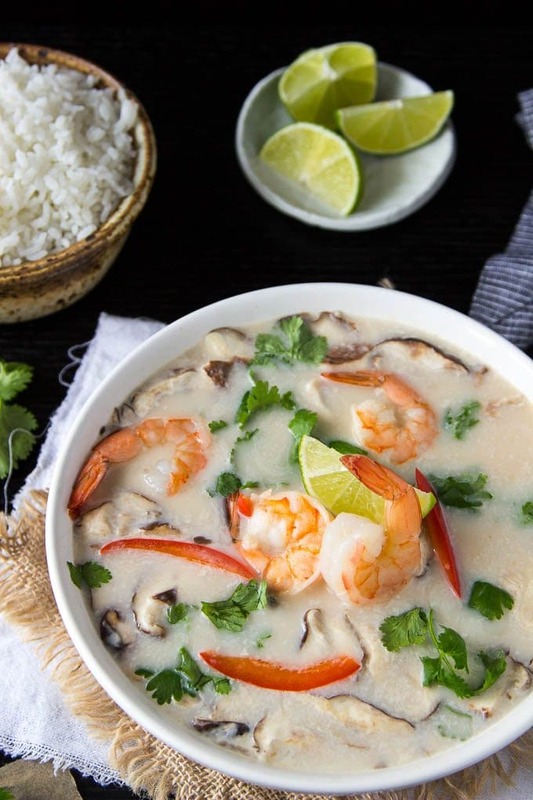 I have had tom kha gai in many places and this recipe was AWESOME! We chose this recipe because you used shrimp and we wanted to use black cod. What an incredible meal. We couldn’t have been more intoxicated with the delightfulness of our masterpiece!